Party Ideas and Tips For a Fun and Memorable New Years Eve! New Years Eve is usually one of the biggest party nights of the year when family and friends get together! It's that time of year again, time to get ready to ring the New Year in with a big celebration! Some people prefer to spend a quiet evening at home while others prefer to whoop it up by partying all night! If you're planning to have a New Years Eve party you know there's lots of work to be done to make the occasion memorable and fun for everyone! There will be a guest list to make, party location, food, beverages, decorations, party favors, attire, and entertainment are all things you will need to address when planning your party. party foodYou'll also need to decide if it should be a themed New Years Eve party or not. Food preparation will be another big decision to make. It's not just a matter of what you will serve, but how or who will prepare it. Do you know what choices you have? Should you have the party in a catering hall or at your house? Who will handle the cleanup after the party? These questions will also need to be addressed. Should you let your guests help you decorate for the party? When making your list of things to do, you will want to be sure to include some fun activities for kids if they will be at the party as well. If kids will be attending the party you also need to consider beverages and sleeping arrangements for them. What if you're on a tight budget and can't afford a big fancy affair, is there a way to still throw a good party? Be sure you have a plan on how to get people home or sleeping space for those who may have too much to drink! There's no need to struggle thru trying to figure everything out on your own, help is available. 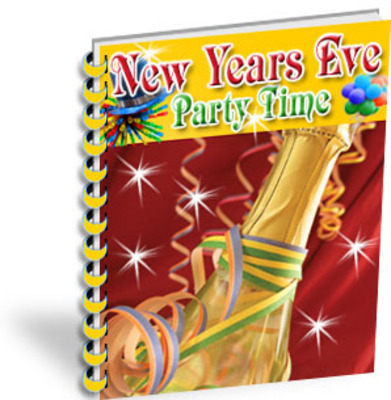 Just imagine having the information you need to help guide you in the right direction for planning and preparing for your New Years Eve party, right at your fingertips! No searching all over the internet or library for information, it's all right here in this handy little guide. Just take a look at some of what's covered in this ebook. If youve been looking for a something that can give you some good tips on how to organize and plan a great party then you'll want to keep reading. If you're open to some helpful tips and ideas then look no further! The information you need is right here, so just click the order button now, then be sure to read it today so you won't forget. You're probably thinking this is going to be expensive, but......Do you want to know what it will cost you to get this "New Years Eve Party Time" information; information that can help you make the most of the holiday season. How To Start And Run Your Affiliate Program+2 Bonuses! Family Budget - With Private Label Rights+2 Mystery Bonuses!